President Bush on Sunday urged people living in the path of Hurricane Katrina to take the storm extremely seriously and to move to safer ground. "We cannot stress enough the danger this hurricane poses to Gulf Coast communities," said the president. "We will do everything in our power to help the people and the communities affected by this storm," President Bush said as Katrina bore down on a stretch of coastline that includes New Orleans, a city sitting below sea level with 485,000 inhabitants. "I urge all citizens to put their own safety and the safety of their families first by moving to safe ground." In addition to packing winds of up to nearly 175 mph, the category five storm also carried a threat of a massive storm surge. Mr. Bush spoke with reporters on his central Texas ranch shortly after New Orleans Mayor Ray Nagin ordered an immediate mandatory evacuation for all of New Orleans. Late Sunday, President Bush pressed for an emergency declaration in Alabama, which would allow federal operations in. Florida, Louisiana and Mississippi were already declared disaster states, CBS News correspondent Mark Knoller reports. Mr. Bush said he had spoken earlier Sunday with federal disaster management officials and with the governors of Louisiana, Mississippi, Alabama and Florida. 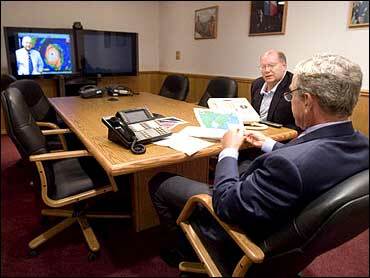 "I appreciate the efforts of the governors to prepare their citizenry for this upcoming storm," Bush said. "I want to thank all the folks at the federal level and the state level who have taken this storm seriously." A day after declaring an emergency for Louisiana, Mr. Bush declared one for the state of Mississippi. Federal emergency workers were sending water, food and other supplies to staging centers in the Southeast expected to be affected by the powerful storm. "These declarations will allow federal agencies to coordinate all disaster relief efforts with state and local officials," Bush said. In Washington, Nicol Andrews, a spokeswoman for the Federal Emergency Management Agency, said, "It's a very dangerous situation at this point. ...We're ready and awaiting landfall." Mr. Bush declared states of emergency in Louisiana and Mississippi to facilitate the emergency response. The American Red Cross was mobilizing volunteers from across the country for what one official called its largest response to a single disaster in many years. "This is really an all-hands-on-deck scenario for the Red Cross right now," spokeswoman Carrie Martin said. The Red Cross urged people, even those who think they are outside the storm's path, to prepare for an emergency. "It could shift at any point. It's really a matter of not taking any chances, having the supplies in place," she said. FEMA was moving supplies from logistics centers in Atlanta and Denton, Texas, to areas closer to where authorities believe the storm will create a need, Andrews said. "The main priority right now is getting that stuff on the road and making sure that we have all the supplies that we have access to are in the right areas so that we can move in immediately," she said, adding that the agency knows "from 30 years' experience that these hurricanes are still largely unpredictable and can turn at a moment's notice." The Red Cross encouraged people to turn to friends and family first rather than shelters because of the magnitude of the evacuation. Shelters should be for those who have nowhere else to go, Martin said. FEMA is coordinating efforts by other federal agencies — including the Coast Guard and the Transportation and Energy departments — and national organizations from the National Response Coordination Center in the Washington area.